The picture shows a little Weather Station based around an ATmega328. What makes this one interesting is that it gets its weather data from Yahoo! Weather rather than a bunch of sensors. What's interesting about that (to paraphrase Dr Johnson) is that it can be done at all on an 8-bit microcontroller. MemoryFree to see how tight RAM was getting. All string constants stored in flash, using either F() or PSTR(). 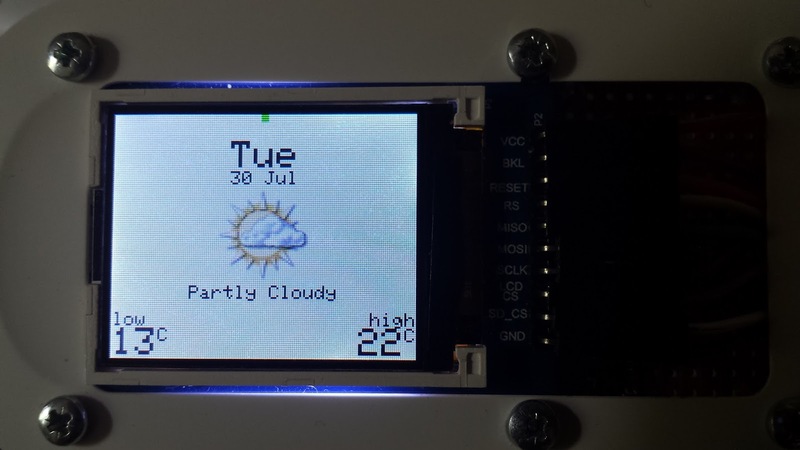 Using the TFT screen for debugging rather than Serial (saves 128 bytes RAM). Graphics downloaded from Yahoo! in advance, converted into bitmaps and stored on a cheap SD card. Reclamation of some flash on the AVR using Optiboot. There is almost no free space left on the chip: just under 200 bytes of RAM (which I guess is needed for the stack) and 512 bytes of flash! 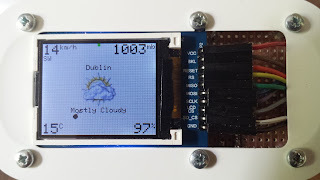 Hey, I'm at the moment looking around how to use ST7735 TFT display with SD-card, can you please help or just give an usefull link how to simple implement a code for avr atmega328p just for use this display? Convert the Adafruit libraries from C++ to C: pretty easy I reckon. You can find lots of C libraries for SD cards, check out Petit FatFs. 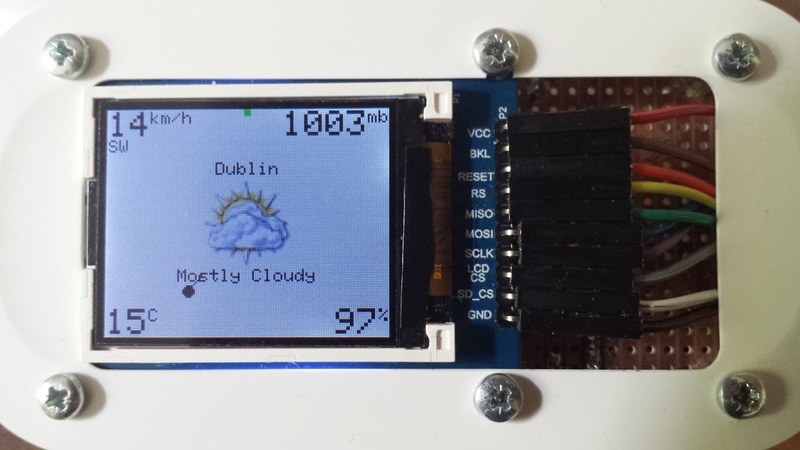 It also provides an SPI implementation which you can re-use to support your converted Adafruit_GFX library.